Wow! This is a truly chilling, spine-tingler! I raced through it, and then towards the end tried to slow down as I didn’t want to finish it too quickly. Angus and Sarah are still trying to get to grips with the tragic loss of one of their twin daughters. Lydia died a year ago, and her surviving twin Kirstie is struggling to manage in a world without her other half. She seems to be disappearing, and isn’t able to cope with anything now that she is on her own. Her behaviour becomes stranger and stranger, until she claims that actually she is Lydia and it was Kirstie who died! As I became enthralled by Kirstie/Lydia, I fluctuated between feeling desperately sorry for her, and wondering whether she was possessed by an element of pure evil! And then there is that ever-lingering question of ‘what if?’ What if a mistake was made on the day of the accident? As increasing questions are revealed about what really happened on that dreadful day, we see a gradual unravelling in the already tenuous family dynamic between Sarah, Angus and Kirstie/Lydia. The setting is perfect for a nail-biting scenario: a remote Scottish island, driving winds and rain, rolling mists. This book contains the right elements to fit into more than one genre. 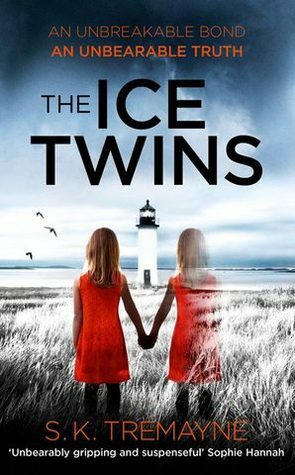 It’s part psychological thriller with hints of drama, and then there’s just that touch of paranormal to make you check the cupboards and under the beds! Highly recommended.